October 21, 2017 October 21, 2017 Dan O. Keep an eye on those farms. Wilfred James (Thomas Jane) is a simple, everyday farmer out in the rural lands of Nebraska. His wife, Arlette (Molly Parker), loves him, even though she doesn’t like how he can be a bit of a dummy, while their son, Henry (Dylan Schmid), looks up to him. It’s a fine, little family that gets by so well because they don’t really have any problems. Then, it all goes to crap when Arlette wants to sell the farm and the land, so that they can make some big money and live her dream of moving to the city. It’s something that she’s always wanted, but Wilfred hasn’t and because of that, he decides that it’s time to get rid of Arlette once and for all. Problem is, when he does just that, more darkness and sinister-intentions begin coming out and it makes Wilfred a scary man, but someone quite dangerous – it’s something that Henry takes note of and is desperately afraid of. Yeah. Not crazy at all. 1922 is a better movie than Netflix’s last Stephen King adaptation, Gerald’s Game, but it also suffers from some of the same issues that that movie just couldn’t get past. Here, there’s actually something of a story that goes places and does interesting things, but by the same token, also feels like it’s stretched maybe 20-30-minutes beyond what it should have been. What would have been a solid, one-hour special on late-night programming, soon turns into an overlong flick about a guy succumbing to his demons and not really surprising us all that much. 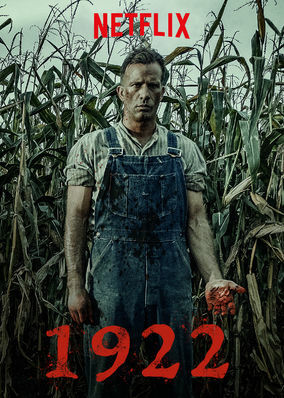 That said, Thomas Jane is pretty great in the lead role and if anything, deserves to have 1922 seen, just for him. I said the same thing about Carla Gugino in Gerald’s Game, but what’s different here is that Jane really digs deep into this challenging and surprisingly complex character that we’re never sure of if we actually want to like, or not. The movie itself never really makes up its mind, either, which is fine, because it helps the performance all that much more. Even though Jane himself constantly gets crap about being a shoddy-actor, there is a certain amount of fun and charm to him that’s hard to deny him of; Wilfred is, a dark and scary person, but Jane gives him a sort of goofiness that helps make this character seem like so much more than just your typical bumble, who speaks in such broken English, you don’t know whether to laugh, or turn on the subtitles. She’s just now realizing that she’s made a mistake, marrying the man that she has. But like I said, 1922 is mostly relying on his performance to save the day, which it does. If anything, writer/director Zak Hilditch does go further and further into more disturbing material than you’d expect, but he can only do so much, for so long. After awhile, it becomes clear where the movie’s going, what it has to say, and that’s about it. It’s pulpy and a little freaky, but at the end of it all, there’s no real shocks, surprises, twists, and/or turns. It’s just a dude turning into a menace, before our very own eyes. And for some reason, that’s not nearly as compelling as you’d hope it would be. Except for that it’s Thomas Jane going nuts before our eyes and yes, he makes it all the better. He always does, people. Give him more stuff to do. Consensus: 1922 isn’t the most essential Stephen King adaptation of 2017, but it features some dark thrills, chills, and a solid turn from Jane to help make it better. Who needs a scarecrow when you can just have this dude out there in the fields?